So very pretty Libby!! Just love all the details and texture in your creation! The stitching really adds so much! TFS! Libby so striking, love it. Another beautiful card! Love the stitching on it. Libby I think it's awesome and such a fun representation of bluebonnets. So pretty! It looks so natural like those flowers! Love the sentiment and stitching! pretty card! 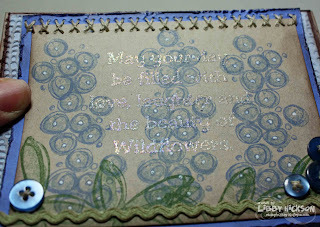 I never thought of using this set for bluebonnets, I totally think they work! Beautiful card! I like how you did the saying. 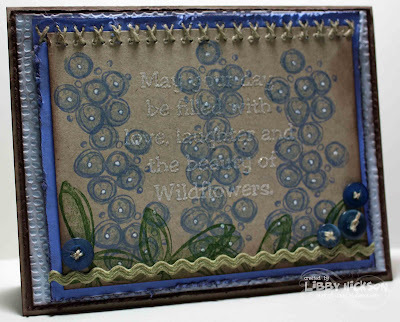 LOVE your Bluebonnets cards, Libby!!! And I know just what you mean about Tom Brokaw -- isn't he amazing? Totally agree about the urge to contribute, but feel overwhelmed when I try to think about how... something to work on, for sure.